Either Apple has really got iPad 2 production ramped up very nicely or demand for the magical tablet is slowing down – as this week shipping times for all models of the iPad 2 have come all the way down to just 24 hours. Shipping times for the iPad 2 have been improving steadily over recent months – three weeks ago we posted on how they had come down to 1-3 days. I’m going to bet that demand is not slowing yet, and that sales may even get more impressive this quarter now that supply is just about matching demand. 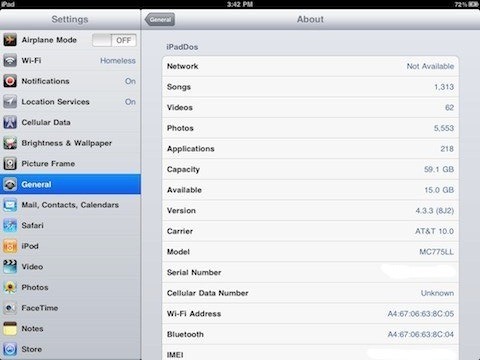 I’ve got a 64GB iPad 2. That’s tons of storage space for a tablet device – but for a number of reasons, I’ve been filling that space up more quickly than I had imagined I would. Earlier this weekend I was down to 15GB free on the iPad 2. So I decided to make a start on some iPad ‘housekeeping’ to free up a bit more space. My first target was Photos on the iPad 2. Yesterday I had over 5,500 photos on the iPad 2, occupying 5.5GB of space. Although it’s lovely having lots of family photos on the iPad to enjoy via the digital picture frame on the iPad’s lock screen, 5,000 is just too many to have on the device – especially when a lot of them are screenshots and photos from past reviews. — First I selected a small number of photos I wanted to be able to put right back on the iPad 2 – a few funny pics of my big Labrador, some wallpapers I like, and mostly screenshots for upcoming reviews. 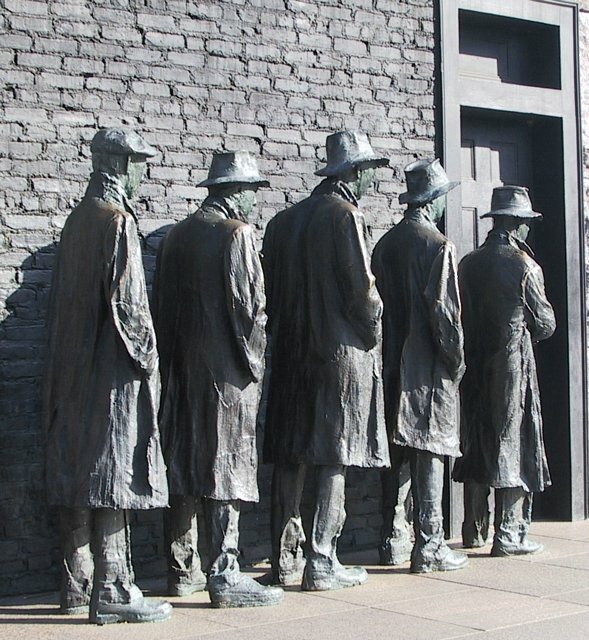 I uploaded these to a Dropbox folder, and then copied them to a new folder in the /Pictures folder on my MacBook Pro. The reason for creating the folder there is that I absolutely hate iPhoto – so I will instead sync photos in iTunes via the /Pictures folder (which is located under your user folder on the Mac). 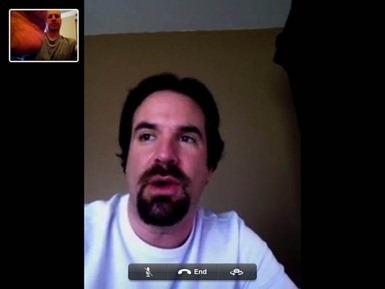 Rene Ritchie of TiPb posted earlier this week about a very nice new feature he tested out in the latest iOS 5 beta: AirPlay mirroring for FaceTime. From the first time I used FaceTime on the iPad 2, I thought it was FaceTime at its best – largely due to the iPad 2’s lovely big screen. Needless to say, being able to throw FaceTime up onto a big HD TV screen would take that to a whole new level. The the only big (BIG!) missing piece for FaceTime would be the promised cross-platform support. Here’s hoping this feature stays in the final release of iOS 5. It looks like Apple has finally got iPad 2 production and supply ramped up sufficiently to meet demand, at least in the US. 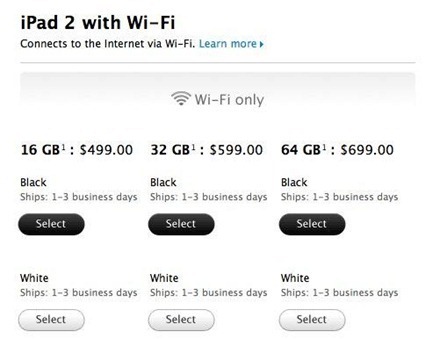 For the first time since the iPad 2 release back in March, shipping times for the device are down to 1-3 days. 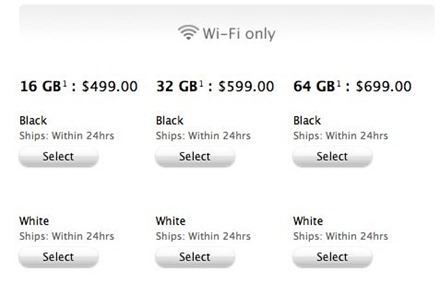 And that’s for all models – WiFi, WiFi + 3G, and both AT&T and Verizon 3G models. Very good news for everyone still looking to buy an iPad 2, and for Apple as this should only add to the already stellar sales numbers for the iPad 2. I ran the new jailbreakme.com jailbreak on my iPad 2 a couple days ago. It had been a long time for me since I’d last run a jailbreak on one of my iPads, though I’ve had my iPhone 4 jailbroken for some time now. If I was summing up my new iPad 2 jailbreak experience two days in I’d say mostly so far, so good – though I have come across a couple of issues, one known and apparently being addressed and one I’ve not heard others mention as yet. It looks like Apple may be gaining a bit of ground in its efforts to match iPad 2 supply to the enormous demand for the device. Shipping times for all iPad 2 models at the US Apple site are down below a week. All the WiFi and WiFi + 3G iPad 2 models are currently listed as shipping in 3-5 days. 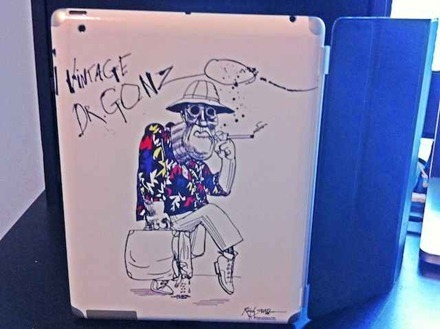 Great news for those still in the market for an iPad 2. 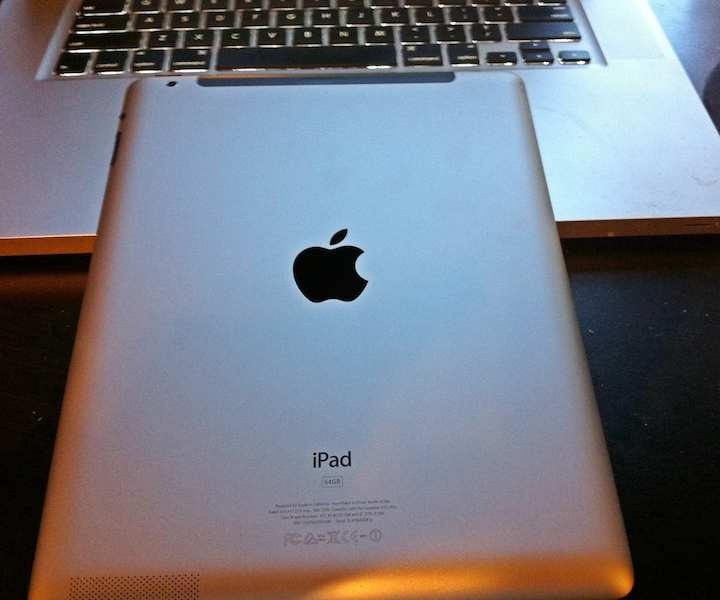 The iPad 2 Smart Cover is one of my favorite things about the latest version of the iPad. It feels so much like a perfect extension of the iPad 2 itself that I very rarely take it off. I started out with mixed feelings about the smart cover in early days with it, but the more I’ve used it the more I’ve grown to love it. 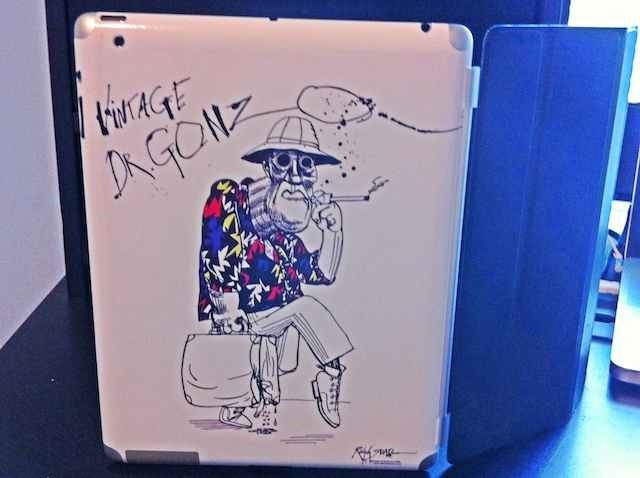 It is now my iPad 2’s BFF. 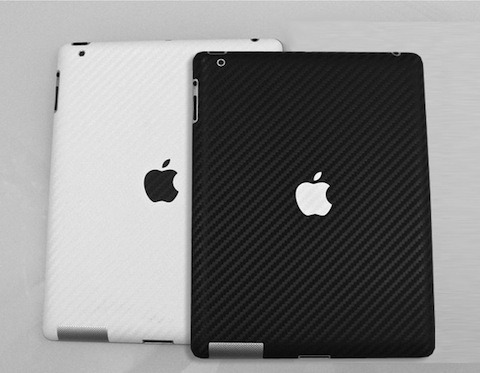 I’ve been continually looking for the ideal companion for the iPad 2 smart cover, because I don’t like having the back of the iPad ‘naked’. I initially went with just a Ghost Armor screen protector for the back cover. That worked well enough and certainly offered stellar protection against nicks and scratches – but I wanted something a little more, or thought I did anyway. So I tried out several iPad 2 back cover cases that are compatible with the smart cover. Most of the back cover cases I’ve tried have been very well made and are high-quality cases – for instance the Speck SmartShell for iPad 2 and the Incipio SmartFeather for iPad 2 – but they all made the iPad 2 feel much heavier to me. None of them actually weigh very much at all, and they feel very light when you hold them on their own, but once they’re on the iPad 2 it just loses that wonderful feeling of lightness that sets it apart from the original iPad. 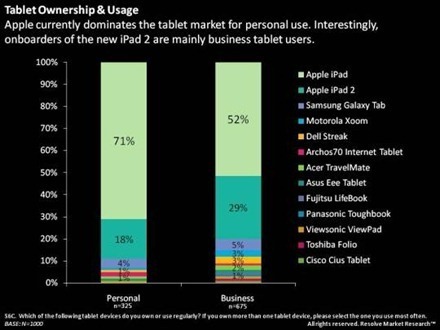 A recent survey of tablet owners in the US is very good news for Apple and the iPad, and for tablet makers in general. Not surprisingly, it’s not great news for makers of laptops, netbooks, and eReader devices. The survey, highlighted in a CNET report and conducted by Resolve Market Research, concludes that tablets are no longer seen as just expensive toys, and shows them having a strong ‘cannibalization’ effect on several other similar product classes. — As we already knew, the iPad currently holds a dominant position in tablet ownership among both personal and business owners. As the chart above shows, they have an 89% share of personal owners in the survey, and an 81% share of business owners. The %age of business owners with an iPad 2 (29%) is impressive. — A chart showing tablets owners thoughts on what type of device they will not buy after owning a tablet is bad news for eReaders (53%, to top the chart) and netbooks/laptops (42% to come in second in a race nobody wants to win).